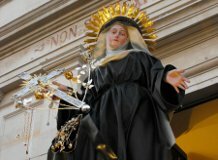 St. Rita of Cascia, one of the most venerated and invoked Saint by practicing Catholics, was born from Antonio Lotti and Amata Ferri, two "pacieri di Cristo” (ancestors of the modern “civil mediator” and/or “mediators", ed) engaged with the struggles between Guelphs and Ghibellines, in 1381 in Roccaporena, village of Cascia (PG). She was named Margherita, but soon everyone called her Rita. The first miracle is attributed to her at only 5 days of its birth, the miracle of White Bees: the parents, engaged in harvesting, left Rita in a cradle under a tree. 5 white bees approaching her, beginning to come in and out of his mouth but without sting, indeed, leaving honey in the mouth of the future Saint. A farmer, in an adjacent field, cuts deep a hand with his scythe. Panicking, he left the job in seeking treatment. Passing to the cradle, and seeing the bees buzzing over to Rita, he tried to drive them away with the injured limb, which amazingly healed. Petite girl, frail, meek, humble, obedient and well-educated (her parents taught her to read and write), from an early age was fascinated by the Augustinian Family, St. John, St. Augustine and St. Nicholas of Tolentino, wanting so much to take one’s vows and want to attend assiduously the Monastery of Santa Maria Maddalena in Cascia and the Church of San Giovanni Battista. But the parents, such as customs, at 13 years old marry off Rita to Paolo di Ferdinando Mancini, violent man, and after 3 years she married him. 2 children born of the marriage, maybe twins: Giangiacomo Antonio and Paolo Maria. Paolo di Ferdinando Mancini converted thanks to Rita, but their union was broken after 18 years when Paolo was murdered by his former comrades. The Mancini family wanted revenge, but Rita not and did not reveal the names of the killers, asking for forgiveness. When she saw that his 2 sons did not want to listen to her, she asked God to see them die rather than pursue their bloody purposes. Shortly afterwards the two brothers fell ill and died. Left alone, at age 36 she tried to enter the Santa Maria Maddalena Augustinian Monastery in Cascia. But was turned down 3 times, for her state of widowhood and because there was a nun in the monastery that was related to the family of Paul, offended by the reticence of the Saint. Only after pacified the two dueling families Rita gets to enter in the Monastery, in 1407: according to legend, were the 3 patron saints St. Augustine, St. John the Baptist and St. Nicholas of Tolentino to take her, from the rock where Rita was going to Roccaporena to pray, right into the chorus. She remained in the Monastery until his death on May 22nd, 1457 at age 76. And is said that Rita completed at least 5 other miracles before his death: vine miracle, still inside the place of worship; that of the thorn (stigmata) of Christ's crown on the forehead, which Rita brought in the last 15 years of her life with the exception of travel to Rome for the canonization of St. Nicholas, when it disappeared and then reappeared once returned to Cascia; shortly before dying, bedridden, she asked her cousin to bring her a rose and two figs from home father. It was winter, but the fruits were there and cousin brought them to her. And the rose became the Ritiano symbol par excellence, a slender and humble woman managed to flourish despite the thorns that life had reserved, giving the good odor of Christ and dissolving the cold winter of many hearts; the day of death was seen a swarm of black bees (called ”murarie”) in the convent, and still have theiir nests near the vine; the bells rang for themselves. The first miracle occurred at Rita late time happens when comes the time to celebrate her funeral. A carpenter, Cicco Barbari, had recently become disable to the hands, unable to work. Seeing the body of Rita, said: “Oh, se non fossi 'struppiato', la farei io questa cassa!” ("Oh, if I were not crippled, I'd do this chest!"). The carpenter was healed immediately, and the nuns commissioned the construction of the coffin to him. Even today it is said that whenever Rita intercede for a miracle his body, still preserved in the Basilica of St. Rita of Cascia, giving off scent of roses. It is also called, as well "Saint of the Roses" and "Saint of the Thorns", by the people "Saint of the Impossibles" given the number of miracles conferred. It was blessed, 180 years after his death, in 1627 under Pope Urban VII. She was canonized during the Jubilee of 1900 by Pope Leo XIII. Cascia each year celebrates its Patron Saint on May 22nd with the Feast of St. Rita.